The Advanti Racing B2 Denaro silver wheel is available in 17, 18 and 19 inch sizes. Staggered sizes available in select sizes and applications. The Advanti Denaro wheel is available for most passenger cars. Free shipping on all Advanti Racing wheels. Free lug kit with the purchase of a set of 4 Advanti B2 Denaro silver wheels. 17x7 5x115 +42 B27751542S $150.60 16.3 Lbs -->> Call or email for special deals! 18x8 5x112 +32 B28851232S $174.00 19.4 Lbs -->> Call or email for special deals! 18x8 5x114.3 +42 B28851442S $174.00 19.4 Lbs -->> Call or email for special deals! 18x8 5x120 +42 B28852042S $174.00 19.4 Lbs -->> Call or email for special deals! 19x8.5 5x112 +32 B29A51232S $198.60 21.3 Lbs -->> Call or email for special deals! 19x8.5 5x114.3 +40 B29A51440S $198.60 21.3 Lbs -->> Call or email for special deals! 19x8.5 5x120 +40 B29A52040S $198.60 21.3 Lbs -->> Call or email for special deals! 19x9.5 5x112 +35 B29N51235S $207.60 21.6 Lbs -->> Call or email for special deals! 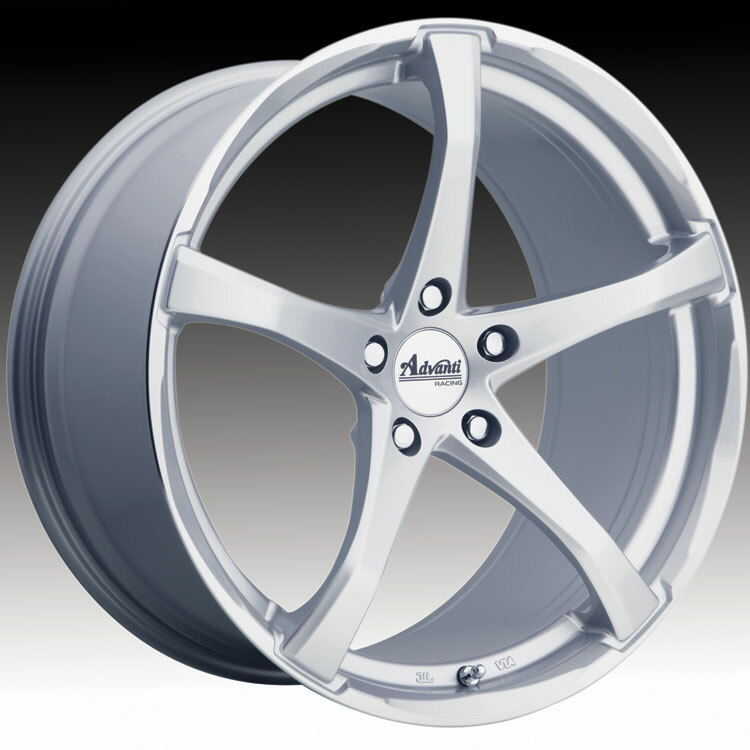 19x9.5 5x114.3 +40 B29N51440S $207.60 21.6 Lbs -->> Call or email for special deals! 19x9.5 5x120 +40 B29N52040S $207.60 21.6 Lbs -->> Call or email for special deals! Advanti Racing Custom Wheels Rims. 1 pc cast alloys ranging in sizes from 17” to 22” designed for passenger cars and cross-over SUV’s. Each Advanti Racing Custom Wheel Rim is precision designed and manufactured to the highest quality and testing standards. For more information, please visit Advanti Racing's webpage.